Imagine if you lost everything today, your site, and your list with thousands of subscribers and you had to start from scratch. What will you do? I f you want to build a list, it takes time, effort and money. You need to earn your subscribers trust and show that you're an expert to build your credibility. Even if you manage to build a list again, you can only sell low ticket items most of the time. Would you rather sell a 100 copies of your product that's worth $10 which comes to $1000 or rather sell 5 copies of a high end offer worth $200 each. That comes to a $1000 as well but you're only dealing with 5 customers compared to a 100 customers at a time. They funny thing is, most of the complains will come from the lower ticket buyers than the high ticket buyers. But how do you sell high ticket items? You need instant credibility and where do you find these high end buyers without any traffic? Webinars Are The Money Making Cash Cows Today! Find Out The Exact Method That Top Internet Marketers Are Using To Rake In Huge Sales With High Ticket Items! Transparency - Most people prefer to talk and interact in person than to read your email messages or blog posts. Even if it's just a voice recording, you have instant credibility because you know what you're talking about. That builds trust with your subscribers. High Conversions - More people will buy from you, when they can hear and see you. As long you provide massive value and great content they will be more responsive to your offer, even if it's a few hundred dollars. Leverage - Even if you don't have a list of subscribers, you can always create a JV partnership and ask another marketer to promote your webinar to his or her list. How to register for GoToWebinar - A step-by-step video on how to get started with one of the best Webinar software out there. How to get targeted audience to your webinar - Where to find your targeted audience that are interested in your topic and will buy from you. How to automate your webinar sessions! 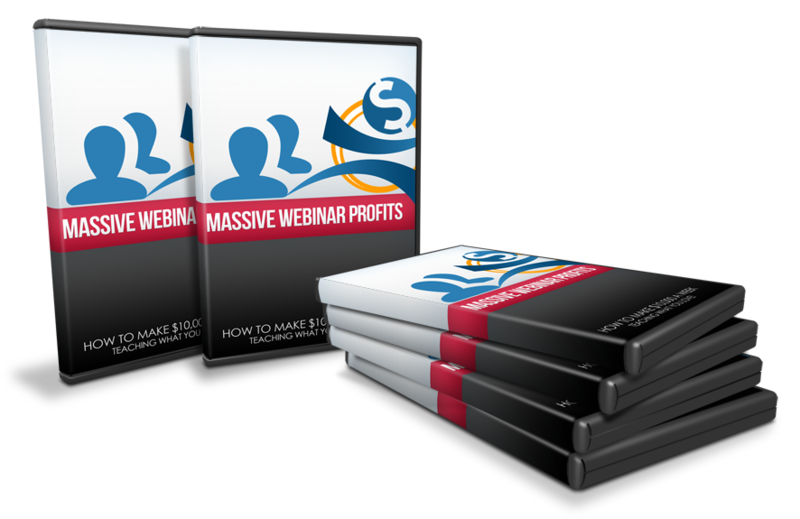 - How set up your webinar session to run automatically and generate more sales for you. ... And you can do all of the above even in the next couple of hours! If You Can Make $10,000 A Week Doing What You Love, How Much Will You Pay To Make That Happen? If you can get just 100 subscribers to your webinar and promote a $200 offer to them, just to be on the low side, a 2% conversion will give you 2 sales. That's $400 with only 2 sales! How much can you possibly earn if you have a bigger audience or a more expensive offer? Instead of promoting $10, $20 products, you can offer high ticket items worth $500 or even $1000 and people will buy it from you once you earn their trust and show what you can do for them. A webinar is a powerful platform thats going to skyrocket your income throught the roof. Here's your chance to learn everything you need to know about webinars and it's a steal! Well there you have it. Place your order now by clicking on the orange button below. You will go through the process of purchasing my course online via the secure server and after successful authentication, you can download this course instantly!